We offer Timer Panel (FFS control panel). Dark on / Light on with Front panel switch. Owing to our rich years of experience in this domain, we have emerged as one of the leading manufacturer and trader of superior quality Control Instruments. 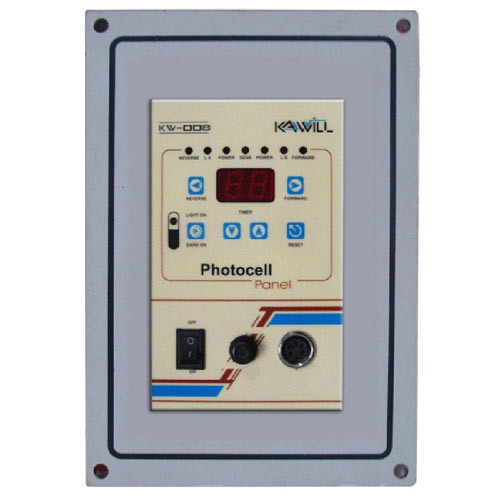 Our product range comprisesIndustrial Photocell, Clutch & Brake Controller, Photocell Clutch & Brake Controller, Rotary Coding Controller, Digital Photo Electric Control Panel, Coding Stop Sensor, Clutch & Brake Control Panel, Fork Sensor, Relay Card etc. By offering these products to the clients, we are successful in attaining the optimum satisfaction of our respectable patrons. These products are widely appreciated in the market for their various features such as high speed operation, longer functioning life and durability. Owing to these feature, customer-oriented approach, on-time deliveries and hard-working employees, we are successful in staying ahead of our counterparts. All the products offered by us are manufactured by following prescribed set of industrial norms to make sure that all products are in compliance with the international quality standards. Moreover, our quality ensure that every product of ours is a synonym of perfection by testing them on various parameters. In order to achieve maximum satisfaction of the clients and to make the process of financial transactions easy we offer them the option of various payment modes such as Cash, Cheque and DD.